A campaign poster from the 1972 presidential election with the words "Now More Than Ever." There are also several campaign buttons attached ranging from the years of the 1950's to 1984, Candidates include Reagan, Ford, Paul Findley, Edward Madigan, Margaret Chase Smith. Nixon items cover 1952, 1956, 1968 and 1972 Presidential Elections. Edward Madigan button from 1972 21st Illinois Congressional District election. Margaret Chase Smith button from 1964 Presidential election. Paul Findley served as the House of Representative in the 20th District of Illinois from 1961 to 1983. 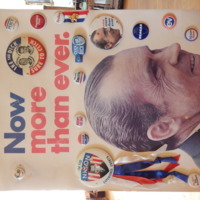 “Nixon Poster for 1972 Presidential Election and Political Buttons ,” UIS History Harvest, accessed April 22, 2019, http://uishistharv1.uis.edu/items/show/108.